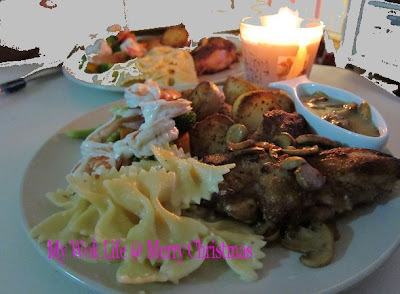 Stay-home celebration was to avoid the crowd… and spending on costly meal outside, just for the festive..
Western Christmas dinner? You, too, could prepare it by your own at home.. It was never too difficult or tedious to do it. 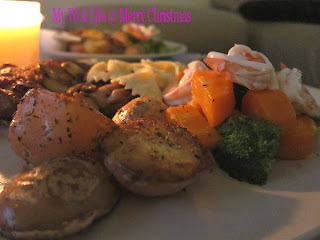 It’s for the festive, and your heart to make your own Christmas meal for the loved ones, isn’t it (smile)? The cold dish (chilled prawns salad) was my favourite.. In order to save the washing, I served all 4-course in a single large serving dish (laughing). Let’s see what I had.. 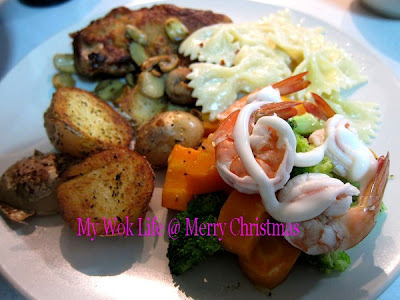 Chilled prawns salad on cheesy broccoli and carrots as cold dish appetizer, Sautéed red potatoes with Italian herbs as side dish, Sour-creamed bowtie pasta and Chicken chop with Mustroom & White wine sauce as mains. The chicken chop was marinated over-night for maximum flavour, and it turned out very flavourful! So, making of mushroom sauce has become secondary. Hence, I served the mushroom sauce separately, as a choice of dipping. Dinner was a hearty one. Compact and satisfying meal, yet, never leave the wallet anyway lighter. We paired our food with some Rosé sparkling wine, too. It costs only S$20, bought from NTUC Fairprice. Its light and slightly sweet taste makes it very easy for the palate. The delicate pale pinkish colour in the wine adds more romantic ambience to our festive dinner. I have also ordered a durian flavoured ice cream log cake from Swensen’s to complete this romantic stay-home festive celebration.. It was great… and it’s all worth the spending! This Western meal is good for any occasion, actually. 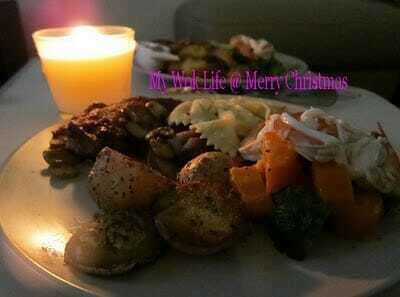 If you are keen, I’ll share my recipes..
Wishing you & your family a Blessed, Joy-filled Christmas & Happy New Year!!! Wah, your candelit dinner look so yummy!! Can share the recipes with us? Sure thing! Will post them soon.. Check it out later..
Love the chicken chop ~ looks so delish and not-oily. I always avoid grilling or frying large pieces of meat cos i might either use too much oil, burn the meat or undercook it haha. Will post chicken chop recipe up tomorrow or so.